Last week I took a position in two area plays which trade on Canadian exchanges. The first one was Macarthur Minerals (MMS.V), and the second one is Chalice Gold Mines (CXN.T). Both have surged in price by 60% and 70% respectively, but they still have relatively small market caps of ~$15 MM and ~$80 MM respectively. Of the two, CXN is a more mature play, with experience, already trading on TSX, and with $53 MM in cash. My industry contacts tell me that both companies have properties that could host a part of the discovery. I recognize that nothing has been economically proven, making this is a risky investment, but I view this as a generational investment opportunity. The kind of opportunity that investors had in the stock of Diamond Fields in November of 1994, at the price of $4.65. A month later that stock tripled in price, as the assay results from the very first hole confirmed the discovery of a massive nickel sulphide. Stock price tripled to $13.50, and kept trending up, culminating in a ~$174 buyout of the legendary Voisey's Bay discovery, in April of 1996. Novo's current stock price of $6.30 could therefore one day seem low. My game plan will then be to continue to add Novo on pullbacks, hopefully at $5.50. I'll add proportionally more of MMS.V, and CXN.T, as I see more upside with these two for now, compared to Novo. I will accumulate these stocks on pullbacks as I never like buying a stock at a 52 week high. Sticking to my belief that we are at the onset of a major resource bull market, I keep allocating more capital to junior resource stocks. While it’s nice to see some decent gains already, I think the Bre-X/Voisey Bay type of investment mania is still ahead of us. Good times! On Wednesday I bought shares of Macarthur Minerals (MMS.V) as a Pilbara region area play to Novo Resources (NVO.V). The Pilbara region of Australia is very hot right now because of Novo, and Macarthur was the one Canadian junior stock with property in the region. The company has over 180 mil shares out, but a tiny market-cap of ~$12 Mil. Furthermore, they just signed an exploration agreement with Artemis Resources (Novo’s Australia partner) to carry the cost of exploration for the right to earn 80% of the interest. Now, Macarthur is actually a Lithium explorer, and there were some nuances to the agreement on which rights specifically Artemis gets...I don't really care. What I do care about is that the news will bring more exposure to this story, and given that it is the only Canadian junior (for now - stay tuned as I may have some updates on this front) with exposure to the region, it is worth speculating on. Note: I bought the stock at $0.06 at the advice of an industry contact who saw a good opportunity for a trade. Neither of us had a clue about the pending agreement with Artemis, though my contact thought it was going to be Novo to setup a junior venture with the company. I guess he was only half right. Montego Resources (MY.C) is starting to move. People behind the company have had a number of successes. I added more to my position today. Novo Resources never really pulled back like I expected it to, so I had to buy at $4, but it is still up over 50% from that level. The story keeps getting better, and the company is simply masterful at exciting the market. This can easily double from here, and even more. I sold some of my shares for a trade, but will buy back on any meaningful pullback. Novo Resources (NVO.V) will pull back tomorrow, and this will be a chance for most of us coming late to the party to buy more shares. Why am I so certain that the stock price will pull back? Well, some 27 million shares bought at $0.66, in the last private placement, will be free trading starting tomorrow. It is hard to imagine that a lot of those buyers won’t be taking a handsome profit. In addition, Newmont resources, one of Novo’s major shareholders, announced on Friday that it disposed of nearly 12 million shares at an average price of $1.60, bringing its stake in the company to 5%, down from 14.9%. This news was a shock to many as Newmont’s investment was seen as a validation of Novo’s work. It is scary to think that Newmont discovered something that reduced their confidence in the company, and caused them to sell their shares at a huge discount. Since the announcement has come out, we’ve learned that the actual transaction was negotiated in July, when the stock was trading around $2, so the $1.60 selling price sounds reasonable. Also, Newmont has been trying to reduce its stake for a long while now, they just happened to have found a buyer only recently. The flipside is of course is that there was an investor with deep pockets eager to take a 9.9% interest in the company. I view this as a positive development. I expect the private placement investors, plus the skeptics who are spooked by the Newmont news, to sell their shares on Tuesday. To me this presents a great buying opportunity and I will look to add to my investment in Novo Resources. Remember, Novo is working on what could turn out to be the biggest gold discovery of the century. Sky’s the limit to the potential stock price, and $50 or even $100 valuation is not out of the question. This is all speculation of course, so trade accordingly. I only invest a minor portion of my portfolio in speculative stocks. 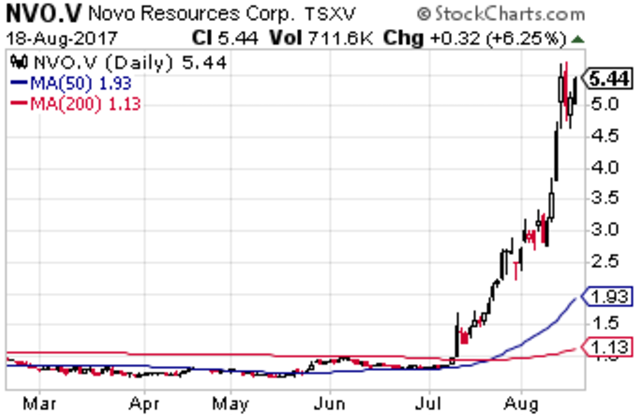 Novo Resources (NVO.V) pulled back to $3.90 and then shot back up to $4.90 on what is a relatively quiet week for this stock. I bought shares on this pullback at $4 and will trade around my core position (see Jim Cramer explain what this means) but I plan on gradually increasing my position through September. I'm hoping for a price pullback in September when some 28 million shares from the last private placement hit the market. I am certainly not the only one anticipating these shares, so I am tampering my expectations on how low the price may come down. For stock gamblers and dream chasers it is immaterial if we buy this stock at $2 or $4 when we believe it is going to $50. So, while Novo Resources is an awesome play, I recognize that the stock is up almost 500% this year, and it would be lunacy to think it is safe to put all my speculative investing money in one basket. I try to build a portfolio of 7 to 10 stocks so as to spread the risk, and I prefer to buy stocks before they move up in price, or on a good pullback. As such, I just bought a stock which has not yet had a significant move in share price, but seems to have a promising future. Novo Resources (NVO.V) is up almost 500% this year, but over the past two days it has pulled back almost 30% from it's all time high, closing at $4. For those of you that dream of making a fortune through a lucky investment, buying on the third day of a pullback (tomorrow) might be a good time to start a position in this speculative play. Remember, no diaper money here, only the money you can afford to lose. Speculative plays will gyrate in value by 50%, and you need to be able stomach that. Now, why would anyone sane invest in these risky plays you ask? Because the upside potential is huge. Novo resources discovery is the talk of the resource community. Nobody knows how big this asset will turn out to be, but it is looking like a vast area with the highest gold grade discovered to date. People are piling into the stock because it has 10 or 20 fold value increase potential in the short term. I generally hate chasing stocks and buying at elevated prices, but this is the leader of the pack with a lot of exciting developments ahead. My view is that it is worth taking even a minor position in this company. Going forward I'll look to bring some plays to you that have not yet moved, but hold great potential. It's been over three years since my last post. Save for the little excitement in cannabis stocks, I felt there wasn't much to write about. Things have changed :). I'm convinced we are in the early innings of a generational investment opportunity in the resource bull market. Anotherwords, we are going to make a killing! The excitement in resource stocks is palpable. Money is flowing into private placements. Insiders are buying like I've never seen before. People I haven't heard from in years are calling inquiring about stocks. People are making comparisons to Bre-X days, when junior companies would shoot from pennies to dollars in a matter of weeks. But what is bringing back the excitement? Comparisons to Bre-X days are due to an incredible story of Novo Resources (NVO.V). People are betting Novo's gold discovery in the northwest corner of Australia is a monster. The company has done a tremendous job of promoting itself, and the stock price has skyrocketed of late. Many speculators expect the stock price to hit $100, just like it did with Bre-X. Now, I didn't actually trade through the exciting bull market during the Bre-X saga, but my closest advisors have, and they are telling me there are many similarities with what is happening today. There is a ton of research material explaining why Novo is an exciting investment and I highly encourage you to read-up on it. It is an exciting story that has already turned into a multi-bagger for my group, but in case you think you've missed the boat, don't fret. There is a good chance this stock is going even higher. Speculation is intense and will last for a long while. I'll be buying on pullbacks. Besides Novo, I have been loading up on various juniors with significant insider buying. I'll be writing about opportunities as they come up. Stay tuned.